The interior of the Cross House was fully wallpapered when it was built. All this was pulled off in the 1950s, down to bare, never-painted plaster, and fully papered again. Poo. I wish I still had 120-years of paper on my walls — layers and layers of time. Today I was scraping the post-1950 papers from the walls of the living room. I knew of course that paper hangers often (always?) leave a note under the new paper they are hanging. Would I find an ancient…tweet? The suddenly, there it was. Curvaceous pencil lines. My heart skipped a beat. My breath grew slightly more rapid. Well, at least I think this is what is written. Gee, I was kinda hoping for more. Still, this was a thrill. Here was a “voice” from January of 1907 “speaking” right to me in December 2014! The interesting thing is that when all the paper was removed in the 1950s, the Atomic Age paper hangers must have seen this note from 1907. I am surprise they did not leave their mark, too. This also would show that at least the living room was redecorated in 1907, fourteen years after the house was built. That does not seem like a long period to replace wallpaper. So, I went back to the Timeline on the Cross House, and this small mystery is explained: the house was sold in 1907. Was the paper installed BEFORE or AFTER the sale? 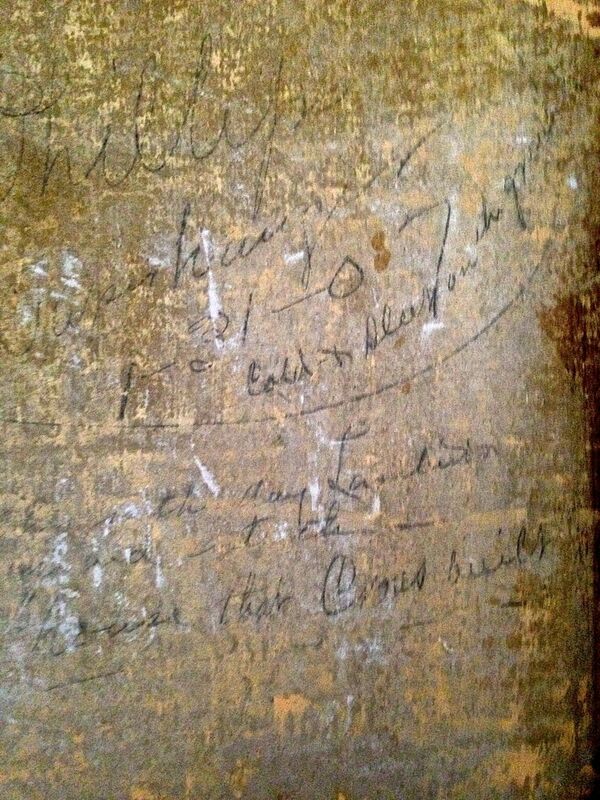 UPDATE 2/12/19: It is now clear that the parlor was re-papered for the new owners, Isaac and Hattie Lambert. If you are intending to replace the wallpaper, Bradbury & Bradbury period hand-painted gorgeous wallpaper is the real deal. Expensive but well worth it. I think it’s “ Cold & Sleet “. Compare the last letter where it touches the 7 from above against the last letters of “ that … built “.